How to apply glitter to T-Shirts - Glitter My World! On this page. we cover the type of glitters you can use and some of the glue options that we like. Want to see a full glitter T-shirt project? Visit the Project Blog on this website. We have one that covers using Tulip glue and the stencil technique. Whenever you plan to do a glitter clothing project, be sure to test your materials first! 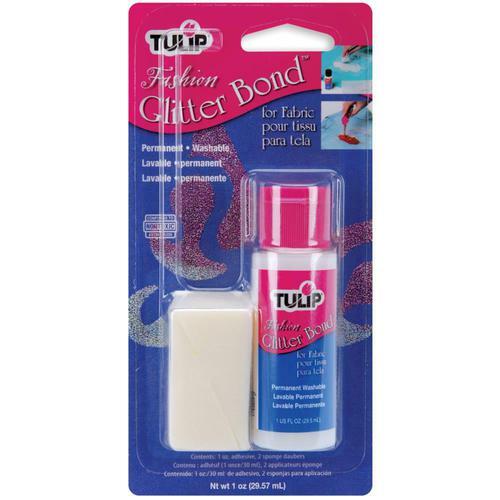 This is a fabric glue that is great to use with glitter. It dries clear and it really holds. It is washable and flexible. It really does not hold up to intense stretching. Applies with a sponge for larger areas (comes with 2) and it also applies with a brush. Glitter Type: Polyester. Make sure you choose one that is water safe (not all are). Glitter that is not water safe may bleed into the glue and onto the shirt. Test before you use any glitter and glue combination! This is a great glue for using on fabrics with glitter. It applies with a fairly fine tip and it can also be applied by a brush for doing more detailed work. It dries clear and flexible. It is OK to wash and holds up under multiple washes (turn clothing inside out during wash). It really does not hold up to intense stretching. Have clothing that stretches? This is the glue for you! It applies with a fine tip and can also be brushed on. It dries clear and remains flexible when dry, even after many washes. Obviously, there are limitations to how much it can stretch. With that said, it really held up when we tried it out. 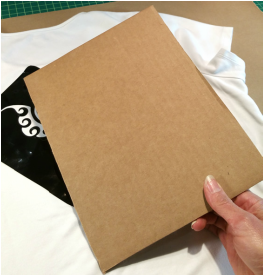 When you use glue on shirts and pants it is a good idea to place a sheet of cardboard covered with foil, plastic or some water-proof barrier inside the clothing. If you do not do this step, the glue that you put on the clothing may soak through to the back and glue both the layers of clothing together. You want the barrier to be waterproof so the glue does not soak through and bond the barrier to the shirt. That can happen when you use plain cardboard. The image to the left shows a design that was created using a stencil. However, even with a stencil you can have spots that get missed. If you need to fill in tiny spots it is a good idea to take a little bit of glue and a little bit of glitter and mix it together. You then apply the mix to the open spot. Using this technique is a little bit easier than trying to put a dab of glue down and the tossing on a few flakes. Want to see a full glitter T-shirt project? Visit the Glitter Project Blog on this website. We have one that covers using Tulip glue and the stencil technique.